Mamas, don’t you hate it when someone tells you how to mother your own child(ren)? Only you know what’s best for your own child! Wait, I think so. Yes. Wait, no. Let me think about that. Who knows the right answer? But many think they know. Co-sleeping is dangerous for your child. Co-sleeping is a wonderful way of bonding with your child. Pacifiers are a no-no. Your child’s teeth will grow in crooked. Pacifiers are a wonderful way to comfort your baby when they’re in distress. Breast-feeding is the only way to feed your baby. Ew! This woman is breastfeeding her baby in public! Can’t she wait, or go to a (nasty) bathroom? Time-out is a good method to use when teaching your child discipline. 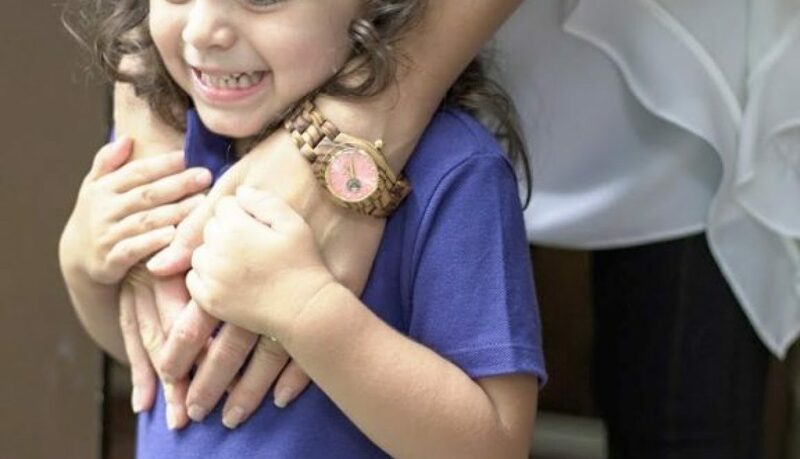 Disciplining your child like that will have an emotional toll on your child. …and it goes on and on and on. We read books, magazines, and blogs. We ask the doctors, nurses, other moms, and our own mamas for advice. We’re human, but we’re expected to be superhuman. Ask for help. Yes, this seems obvious, but sometimes it’s not as easy as it sounds. You don’t have to carry the weight of the world on your shoulders alone. It does take a village. 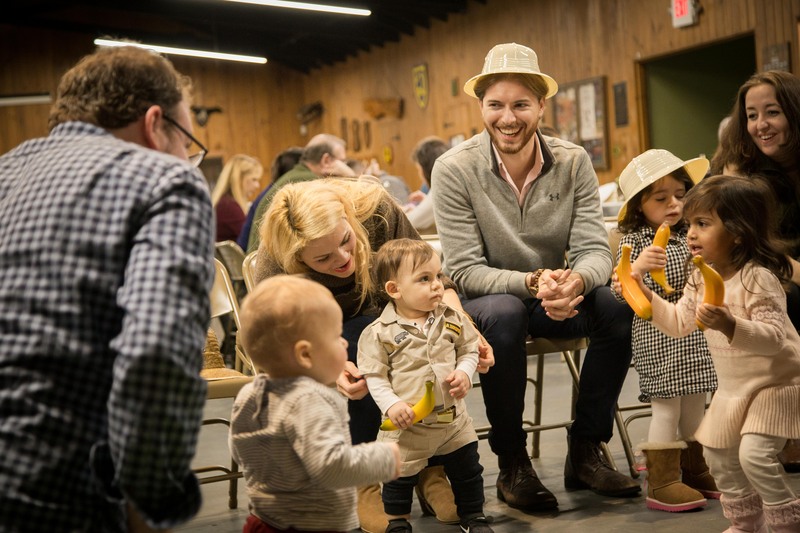 Ask for help from your partner, your in;laws, and your trusted village so you never feel your children aren’t spending quality time with someone they enjoy. Understanding that guilt can be a reflex for many of us, sometimes using words of affirmation helps to counter-balance the negativity. Try speaking these words to yourself when you feel guilt, “I’m doing the best I can”, “I’m doing the right thing for my child(ren)”, “I love my children and I am doing what’s best”, “Everything is ok, and will continue to be ok”, etc. Find the phrases that work best for you. Check out this great reference HERE. There is no such thing as a “perfect mom”. 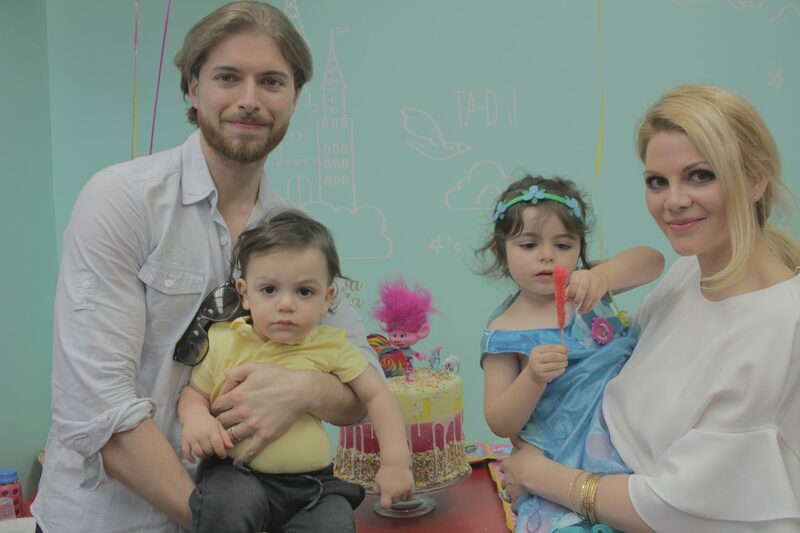 YOU are the perfect mom for your child(ren). Even in the days of June Cleaver, moms did the best they could with what they had. That’s all you can do. The issue these days is that we compare ourselves to what we see around us. 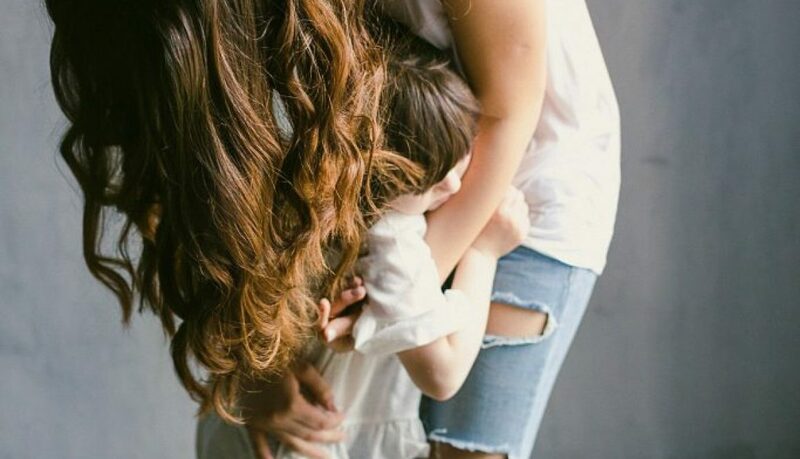 We come up with the idea that we aren’t as good as moms we see on Instagram (sound familiar?). We don’t really know what’s going on in their lives and, to be honest, I’m pretty sure it’s not all sunshine and cuddles. Pictures give us inspiration and insight, but we shouldn’t use them as a comparison. What kind of mom do YOU want to be? 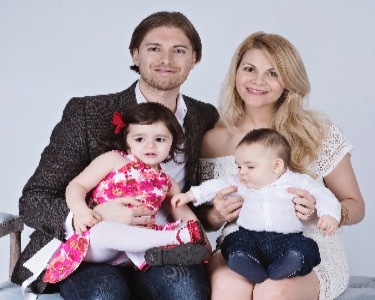 What kind of mom do you want to be REALISTICALLY? Is your answer “loving”? You already are! 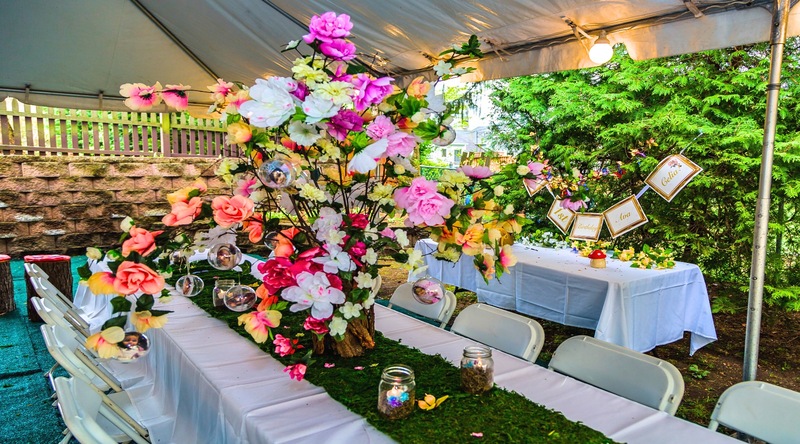 Is your answer “a mom who’s got it all together”? What does that even mean? This depends on your perspective. Just know that you’re enough, just as you are, doing the best with what you have, in this day and age. There might be a few things you could tweak, but who couldn’t? We’re human. You’re a loving mother. Please don’t lose sight of that. Itching for a new adventure or craving excitement in your next vacation ? 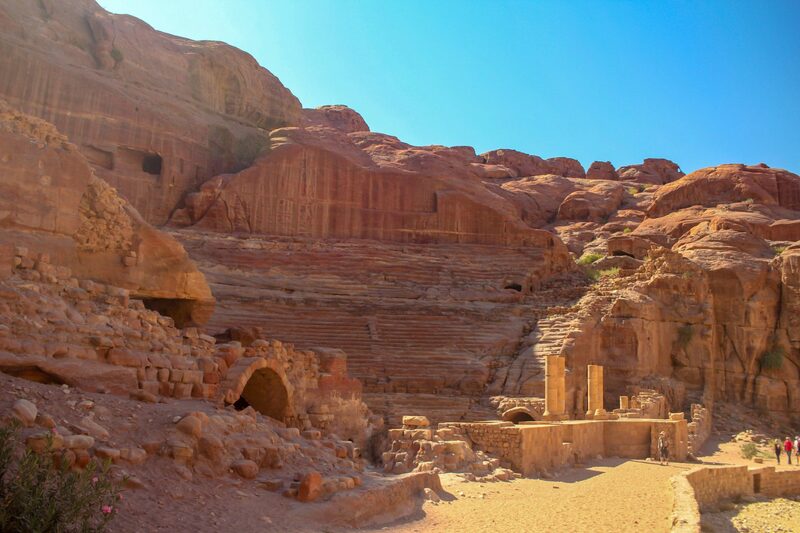 Consider the land of lost cities and the place where great stories such as “Lawrence of Arabia” and “Indiana Jones and the Temple of Doom” were made–Jordan! 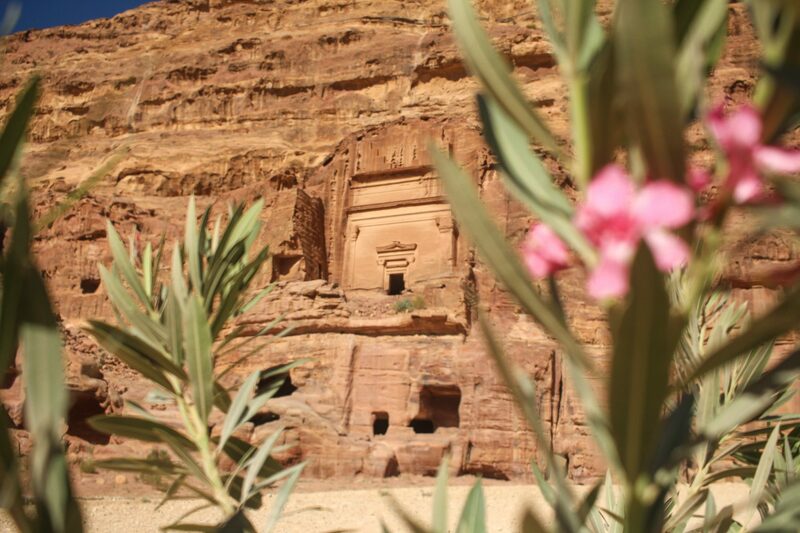 Truly, when scouting for amazing destinations, consider putting Jordan at the top of your list. 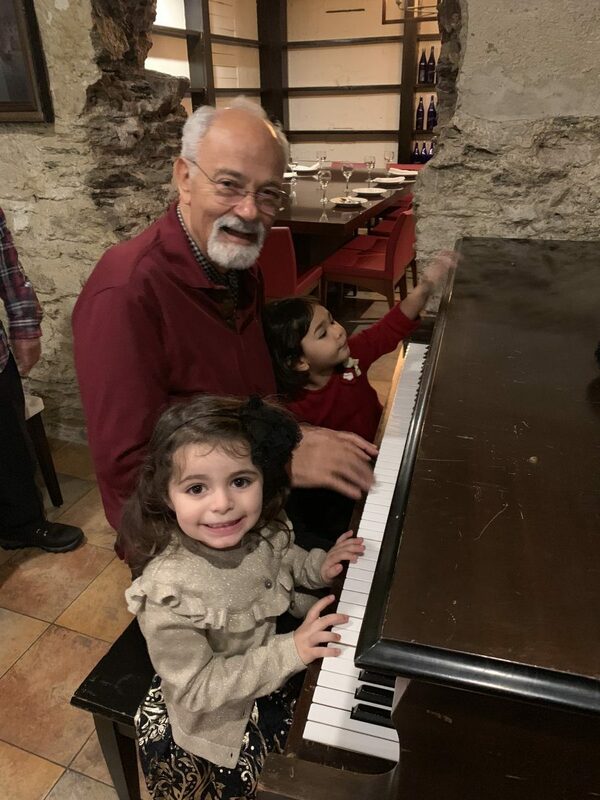 For one, it is by far one of the safest countries in the Middle East, and two it is full of culture and rich in history. Other reasons to go? 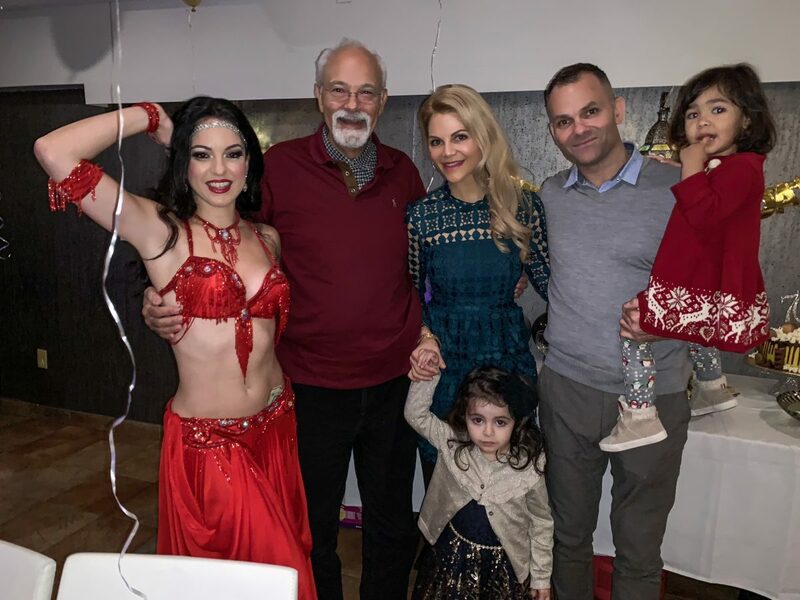 It can also be very affordable for the discerning vacationer as lodging and food is considerably less than Europe or even certain parts of the United States. My husband and I recently visited Jordan for a cousin’s wedding (sans kids). This was my husband’s first time to Jordan, and for that matter, the Middle East. 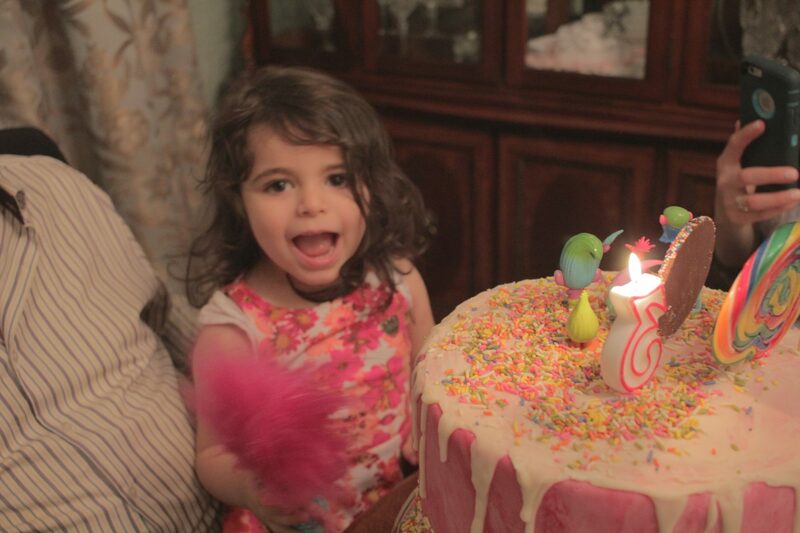 Since we left our toddlers behind for this adventure, we decided to only stay six days. So here are my recommendations for 5 amazing destinations within Jordan when you are short on time but want to experience it all! You absolutely can’t miss the amazing sights of this ancient City! 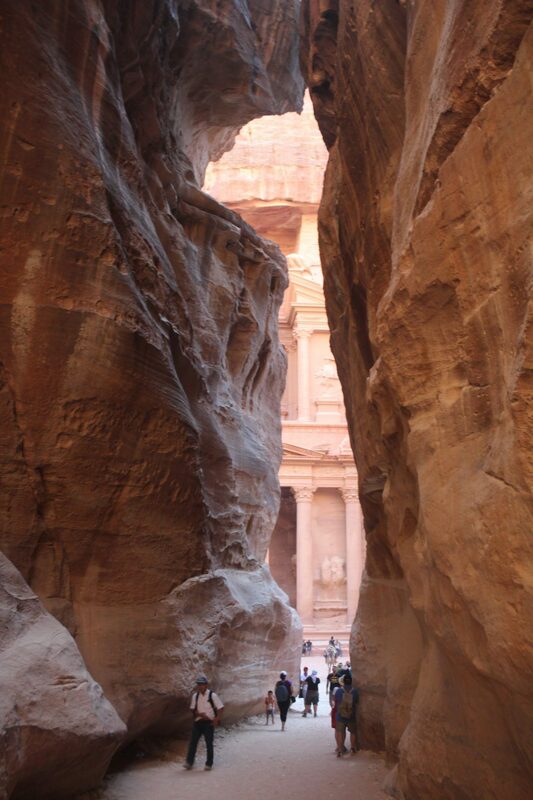 Petra literally means “Rock” in Greek, and is an ancient city surrounded by cliffs. Carved out of these rocks and cliffs are ancient tombs, temples and caves. Have you seen Indiana Jones and the Temple of Doom? That was filmed in Petra! 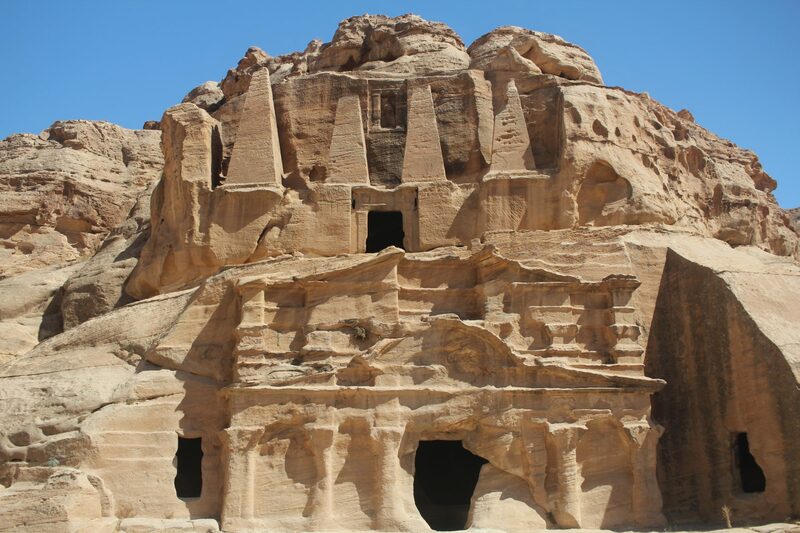 Here you will discover the Great Temple, a two-story palace estimated from 1st century BC, only accessible by walking the siq (a narrow gorge approximately .75 miles or 1.2 km long and at times only 10 ft or 3 M wide). 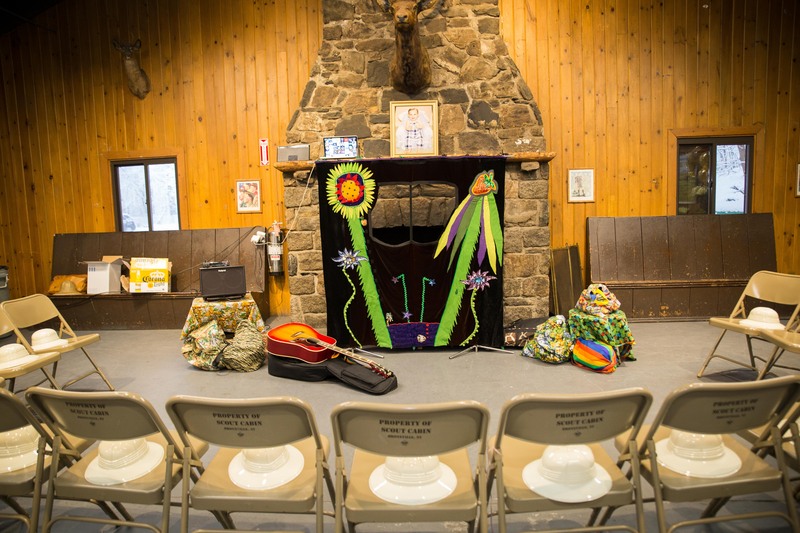 You can also visit an ancient theater built approximately the same time that may have seated over 800 spectators. 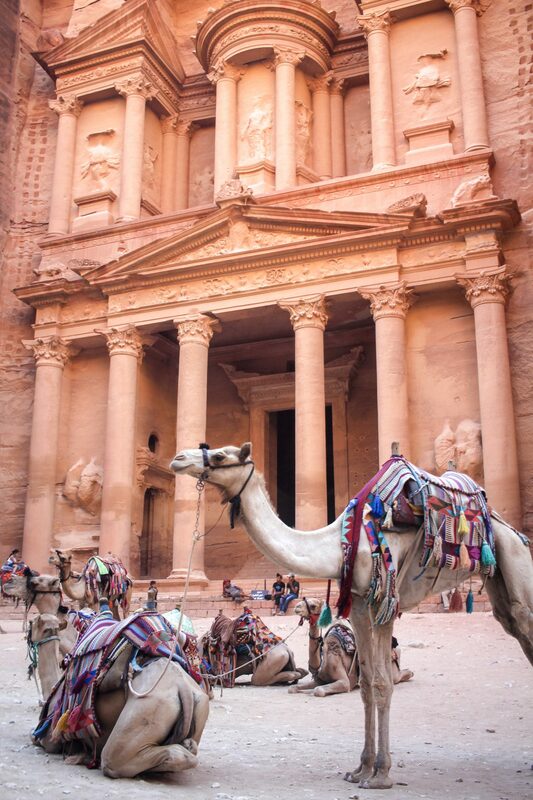 As one of the 7 wonders of the world, it really should be on your list to visit if you are in Jordan! Getting to Petra is a bit of a trip, however. You can take scheduled, air-conditioned JETT buses in downtown Amman at 6:30am everyday for approximately $15. Or you can hire a driver/cab to take you and stay with you for 4-5 hours for about $150. It is affordable to go, just a bit of a hike to get there. From Amman, Jordan it takes about 3 hours (if you have a fast driver!). There are two roads to get to Petra, the highway or along the Dead Sea. We wanted to get more of a scenic route so we chose the Dead Sea route. Be prepared to hang on for your lives, literally! 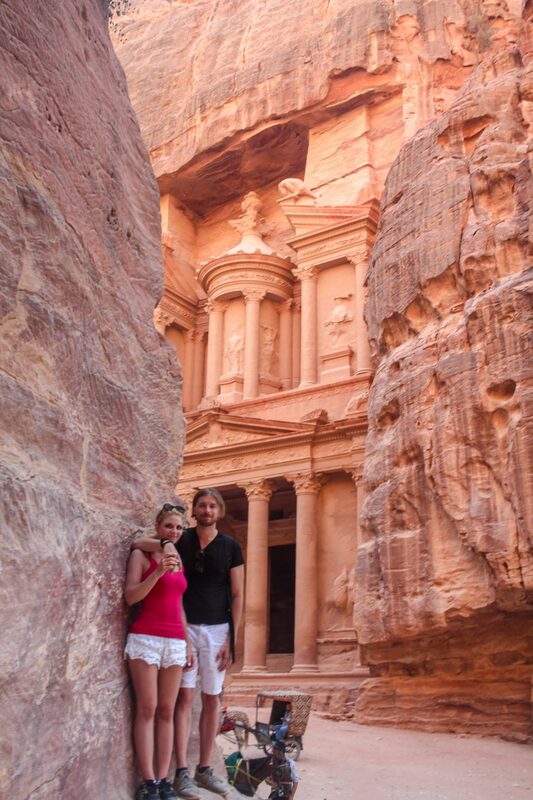 Tip: Consider visiting Petra in the evening after the sunsets for the Petra Night Show. 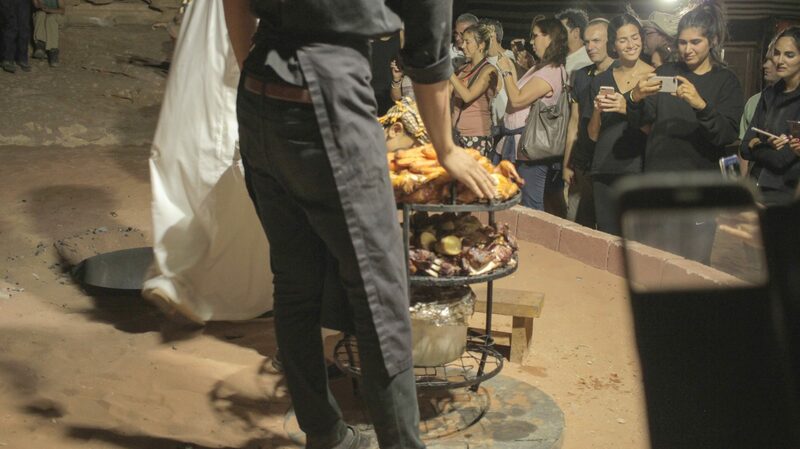 This event is a magical experience, as you can explore this ancient city by candlelight! Over 1500 candles light up the walkways and historic attractions every Monday, Wednesday and Thursday of each week from 8:30PM to 10:30PM. 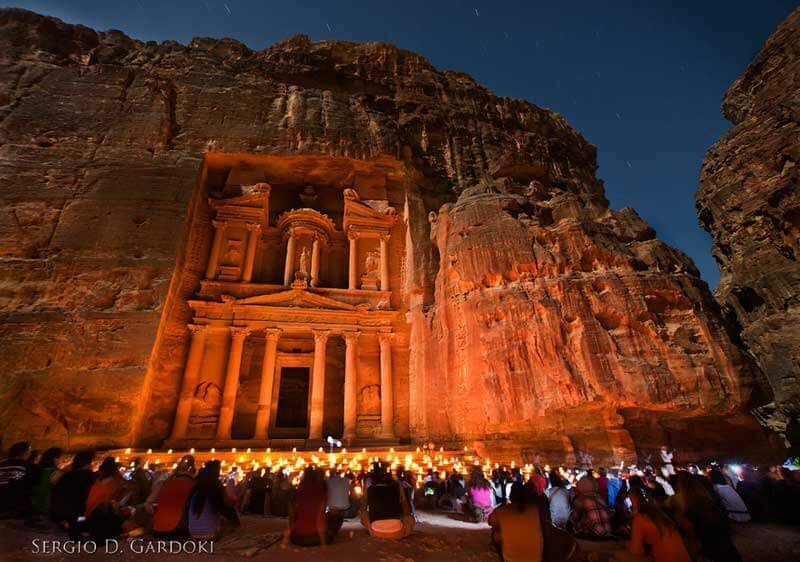 Unfortunately we were unable to visit on one of those days so we missed out, but here are some images of the Petra Night Show curtesy of Petra tourism authority. Dead Sea products have been gaining more and more popularity, but do you know where they come from? The Dead Sea! The Dead Sea should actually be the number 1 reason to visit Jordan NOW, as it may not be around ten years from now. Unfortunately, the Dead Sea really is dying, well shrinking actually. Back in 1964, the Dead Sea lost a substantial water source when Israel began diverting water from the Sea of Galilee (this feeds into the River Jordan, which feeds into the Dead Sea) to Israel’s national water system for drinking water. 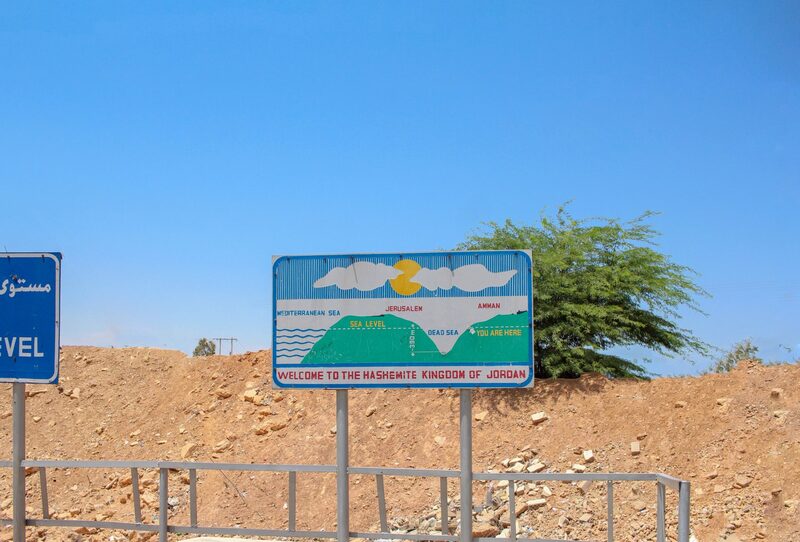 In addition, because the River Jordan is more of a stream than a river, Jordanians have been purifying water from the dead sea to use as their own water resource for human and agricultural use. Then there is natural evaporation. All of these issues have compounded and has caused the Dead Sea to shrink. Each year. By almost 3 Feet. So why visit? The Dead Sea is an experience like no other–it has more salt than any body of water (34% saline) so you will literally float from the buoyancy! It is also healing and full of minerals and salts. Visitors come from all over the world to bathe here, seeking relief of health ailments. Before heading into the water, make sure you cover yourself with the clay–it is chalk full of minerals that will leave you feeling soft and supple. Not even kidding, it is life changing. Interesting fact: The shore of the dead Sea is the lowest point on dry land on the planet! 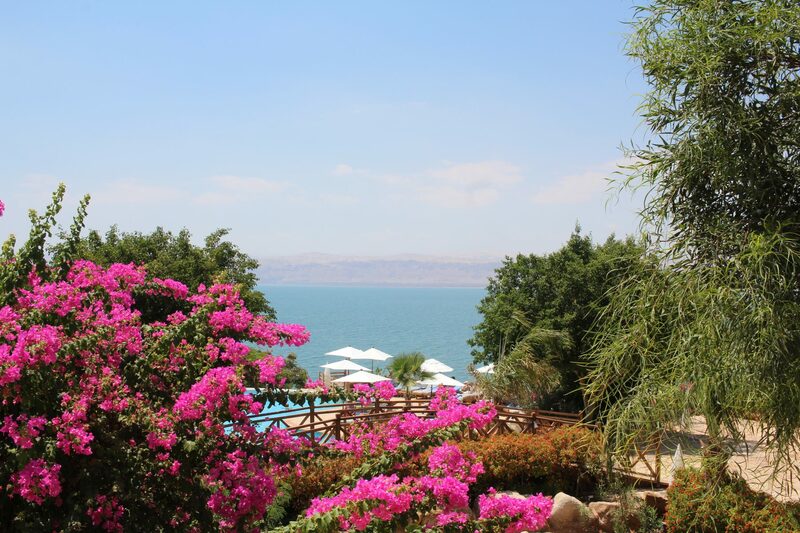 I recommend staying at one of the resorts along the Dead Sea. 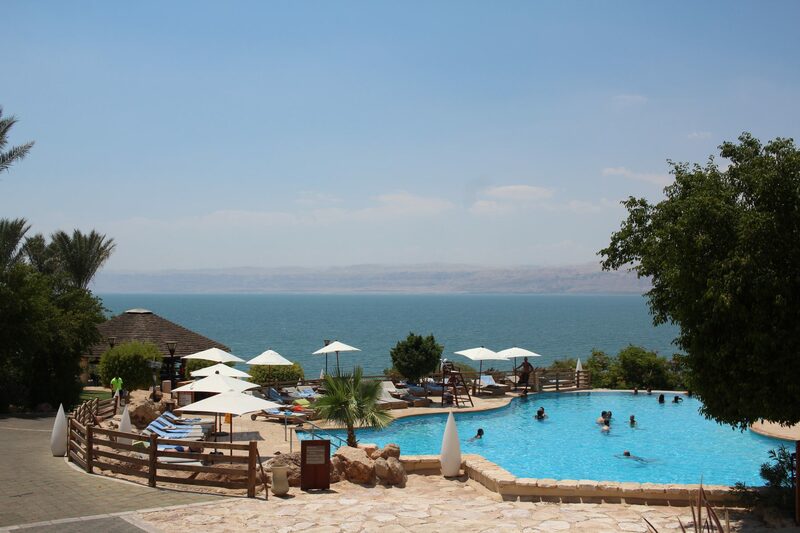 We visited the Marriott, but there are multiple choices with Dead Sea beach-access. The Kempinski, Hilton, Holiday Inn, Crowne Plaza to name a few are all along the Dead Sea’s shore; and all very luxurious with many amenities to offer. Looking for just a day trip to the Dead Sea? No problem, you can access the Dead Sea from any resort hotel without booking a stay, the charge is roughly $45 per person (pay at the hotel gate). 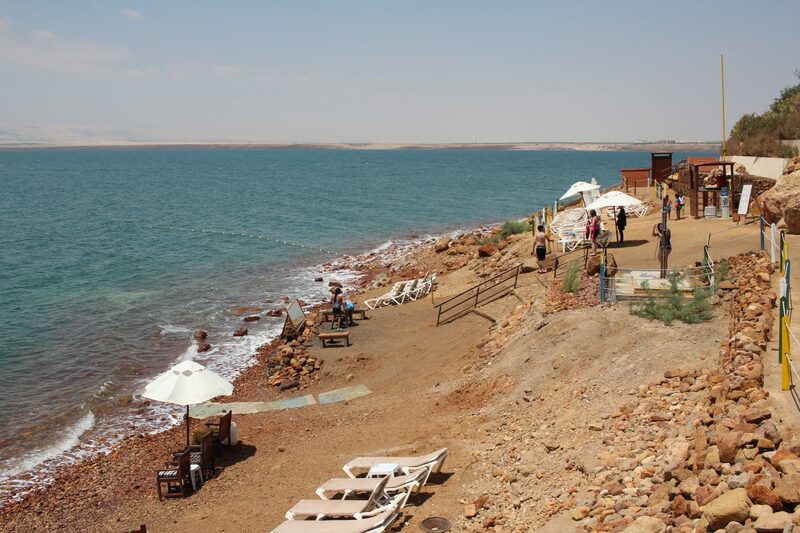 In Jordan, the Dead Sea is really only accessible through a hotel resort. The good thing is the charge covers access to the resorts pools, towels and showing facilities. 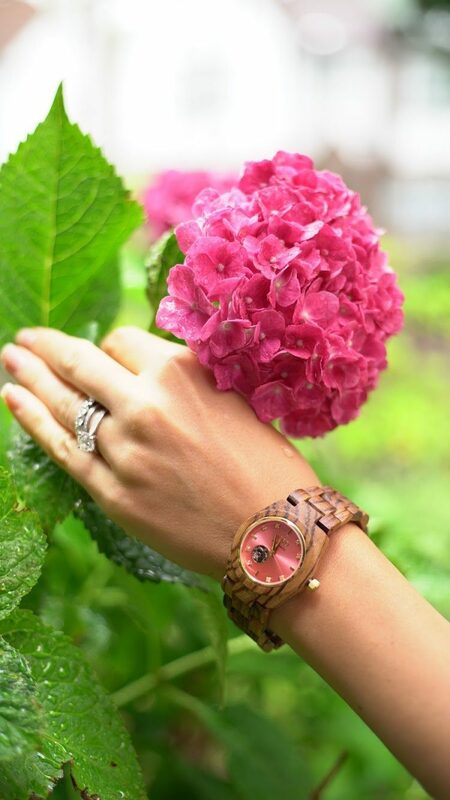 Plan to stay the entire day to really take advantage of your time here! Ever dreamed of visiting Mars? What about touring where “The Martian” was filmed? 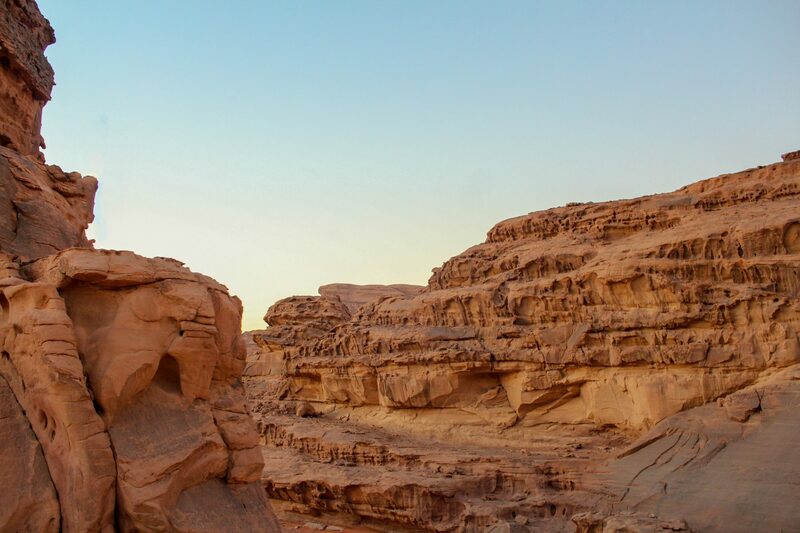 If so, you really can’t miss visiting the magical landscape of Wadi Rum, which means “dessert valley” in Arabic. 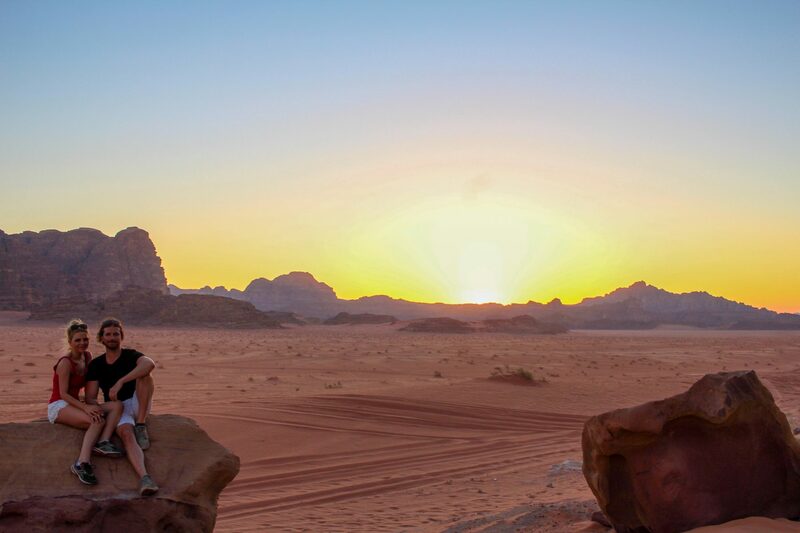 Wadi Rum is the largest dessert valley in Jordan, and is famous for its spectacular dessert sunsets (very romantic) and nighttime star-gazing. It is also famous for the filming of major movies such as “The Martian” (2015), “Rogue One: Star Wars” (2016), “Transformers”, and “Prometheus” to name a few. It really does resemble Mars with its pink sand and Mars-like rock formations. If you plan to make an evening trip, come at least a half hour before sunset (in August you would want to arrive around 7pm). 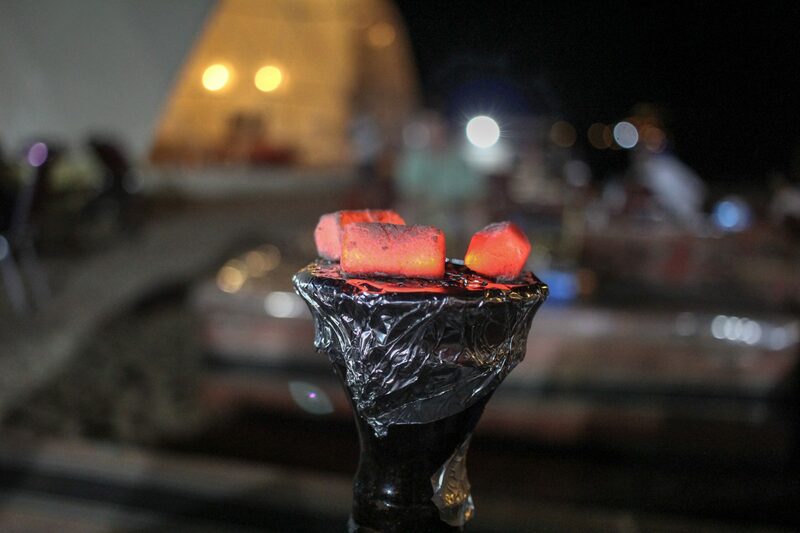 Here you can hire Bedouins to take you by camel or by AWD to Wadi Rum to see the magnificent sunsets. Feeling more ambitious? 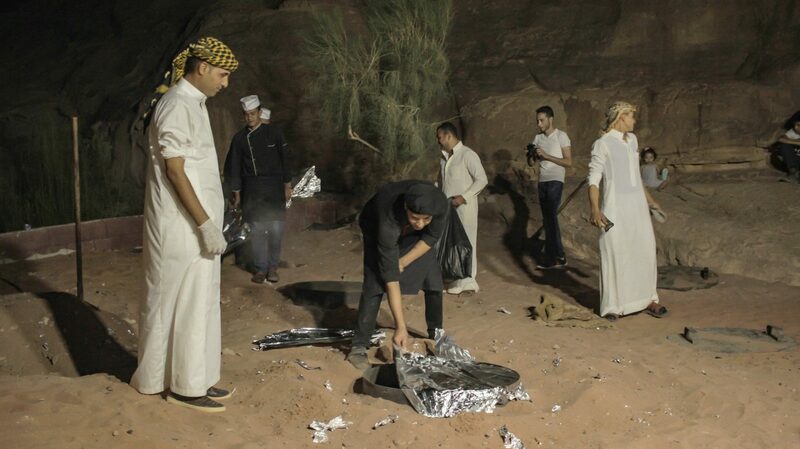 They will also take you dessert racing through the Wadi Rum if you want an Adrenalin rush! 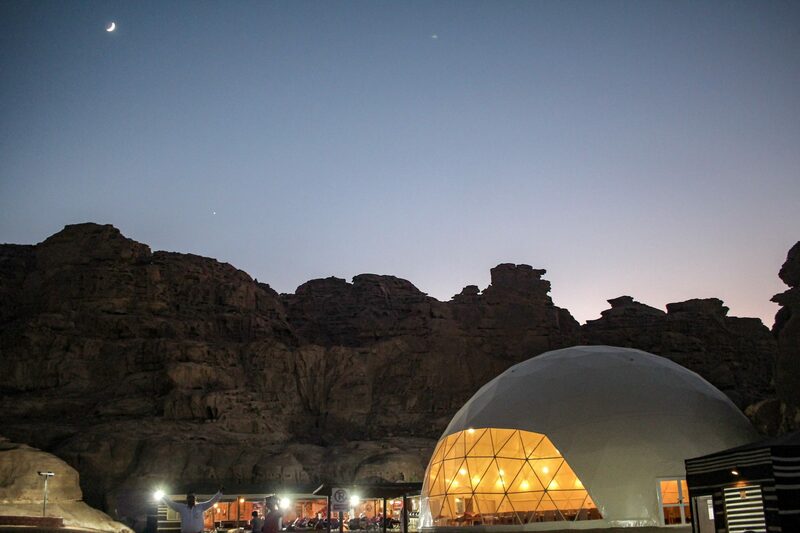 If you can stay a night or two, check out the luxurious camps where you can sleep under the stars in “Bubble Rooms”, or have authentic Bedouins dining experience in the desert. We were short on time, so just stopped to see the spectacular sunset after our trip to Petra. We also ate dinner with the Bedouins and danced a bit before returning to Amman. It was an experience we will never forget and will cherish always. If you are spending a day in Amman and want to shop from local vendors, I suggest you visit Rainbow Street in Souk Jara which is one of the oldest souks (marketplaces) in Amman. 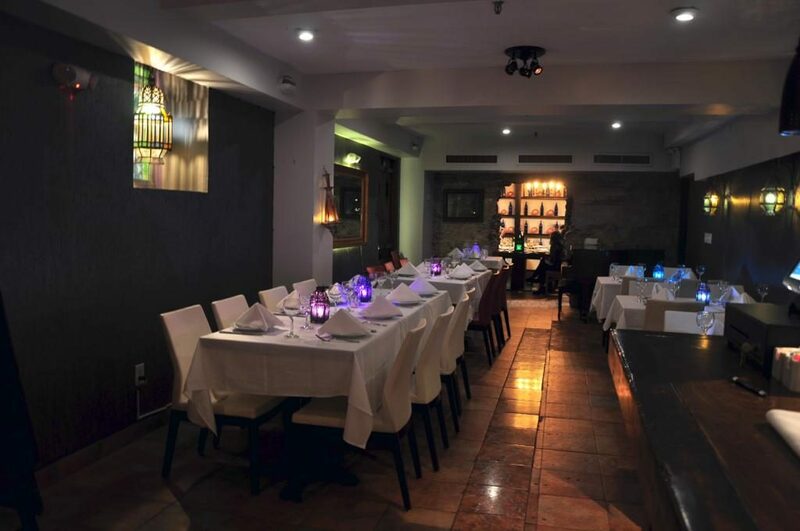 Be sure to visit Hashem, the oldest restaurant in Amman that boasts visits from the King of Jordan, diplomats and celebrities reguarly! Hashem is famous for their falafel, a deep fried ball made with ground chickpeas, chopped parsley and herbs. 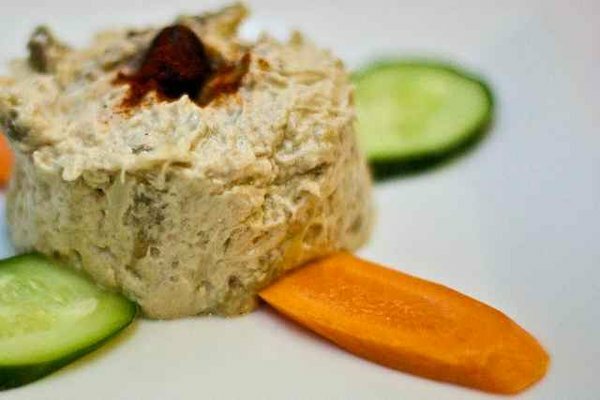 A close second is Al Quds Falafel right off Rainbow street, and perfect for grabbing a fresh humus and falafel sandwich on your way to shopping. If you are with kids, the Souk Jara is actually quite kid friendly, and at the bottom of the marketplace there is booths for face-painting, a bouncy house and other family activities. There is so much to offer in Amman, Jordan, so make sure you spend at least 48 hours in this historic city. Take in the full architectural splendor from atop the Amman Citadel, where you will find the Temple of Hercules and the Hand of Hercules, built between 162-166 AD. Larger than any temple in Rome, it is a must see when visiting Amman. From here you can also walk/cab it to the 2nd-century Roman Amphitheater which seated 6,000, a glorious sight where you can just imagine the spectators cheering centuries before us. 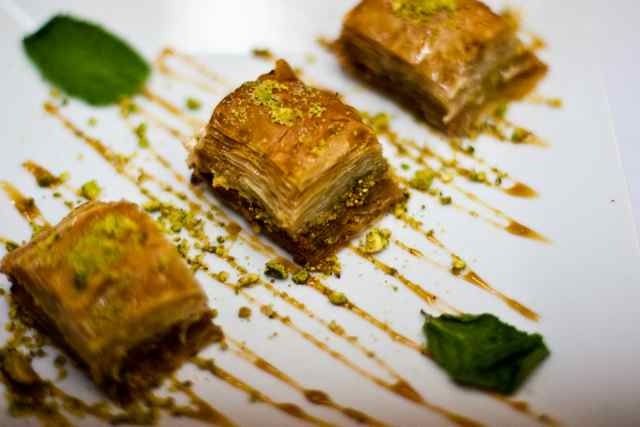 After walking and exploring, if you are craving something sweet, be sure to try Kunafa, a traditional Arabic dessert with layered cheese and shredded filo soaked in simple syrup and topped with pistachios. According to the locals the best Kunafa in Amman is Habibah Sweets , and for me conjures up the most delicous Kunafa found in Neblus, Palestine. 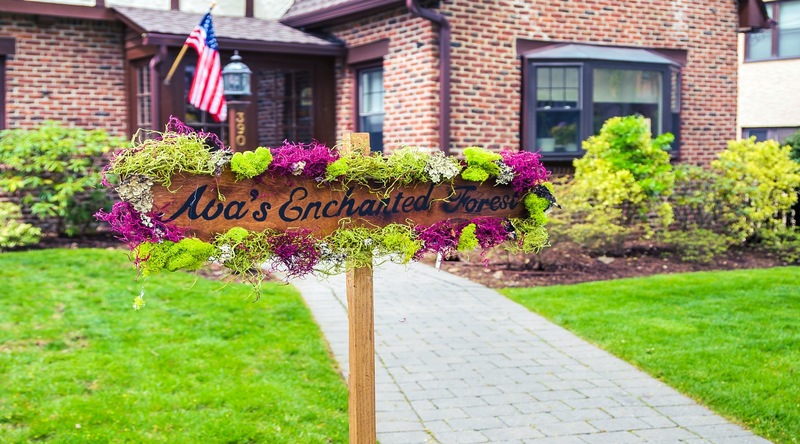 Not surprisingly, the owner Al-Haj Mahmoud Habibah is originally from Neblus! 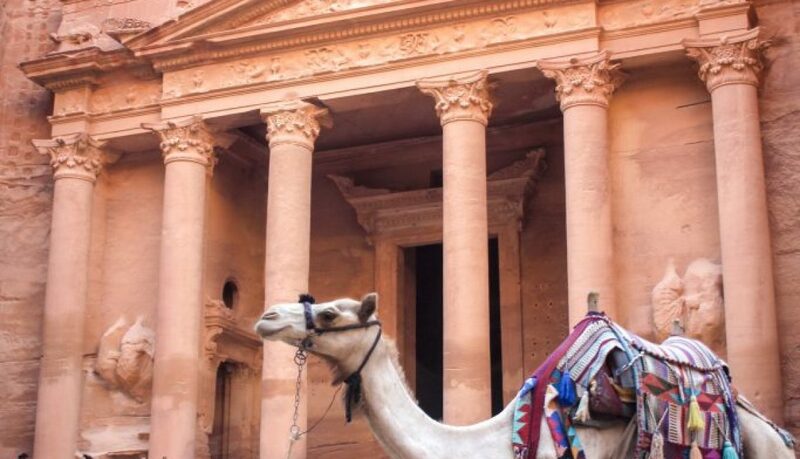 Hope you enjoy your travels in Jordan, we certainly did! Trolls, trolls, trolls…calling all trolls! 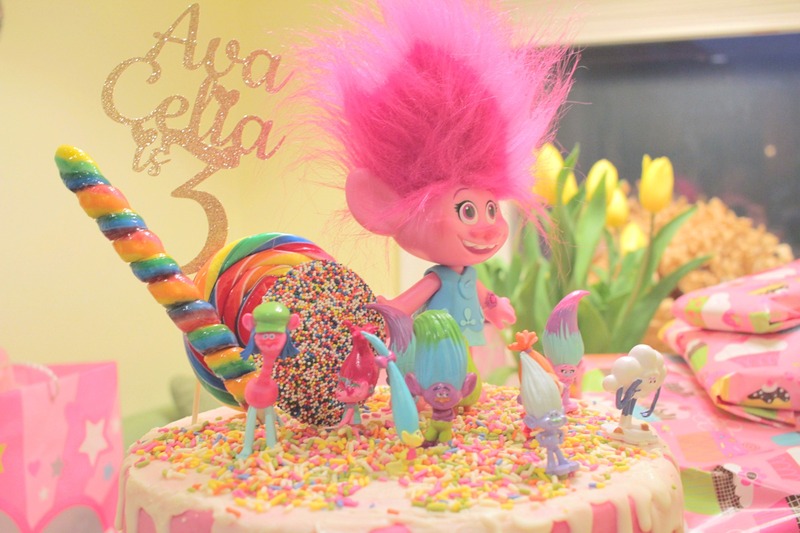 Did I say my little 3 year old Ava is obsessed with all things Poppy, Branch and TROLLS?! 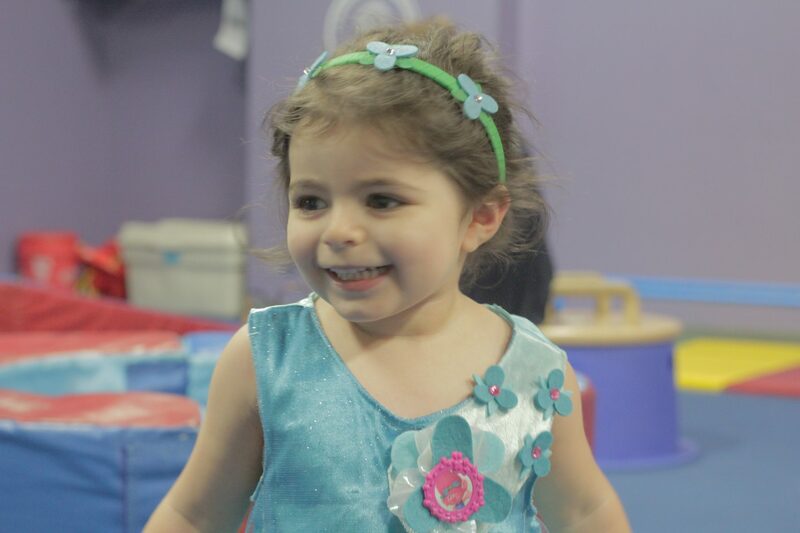 Crazy, 3 years have come and gone, and now my toddler is out of the toddler years and a sweet little 3 year old saying please, thank you, and scolding her little brother for misbehaving. 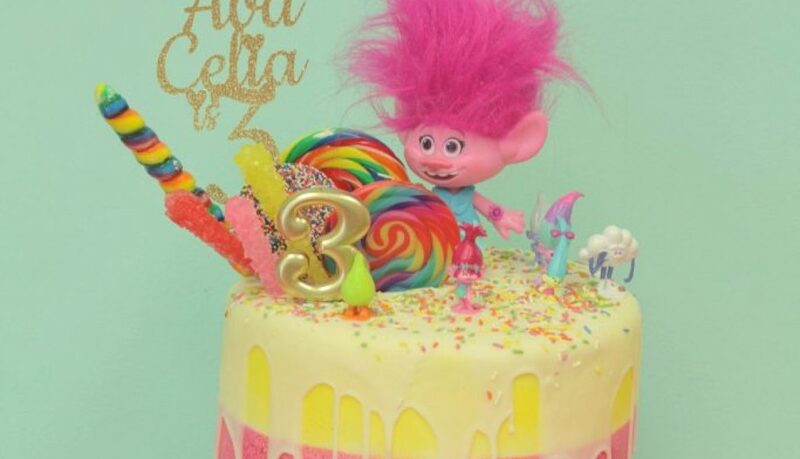 What kind of party could we have, but one with a subtle nod to our little Poppy, queen of the trolls? 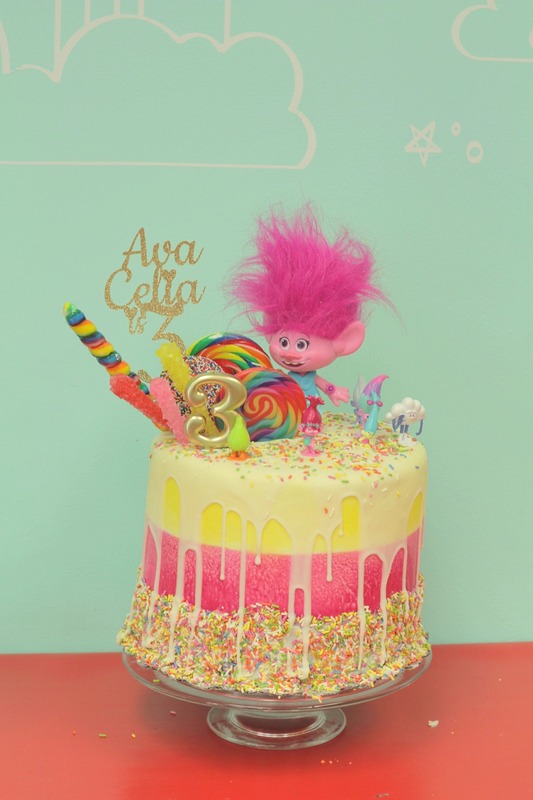 A troll-tastic party with a troll cake of course! 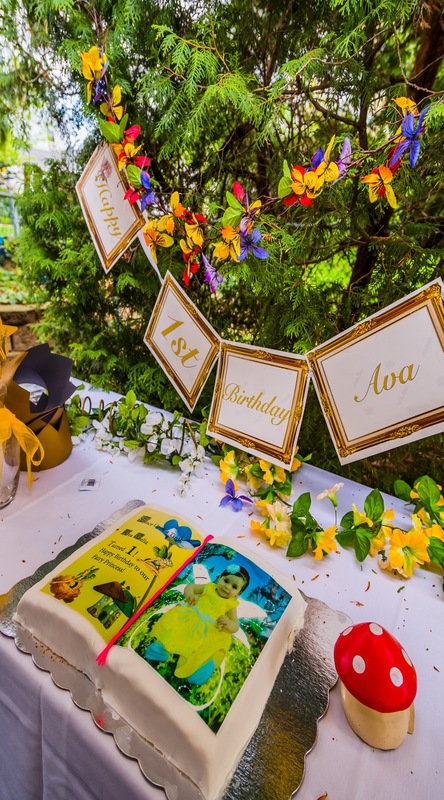 We decided this year to have Ava’s party at a play gym–these seem to be super popular with toddlers and 3 year-olds, as they can tumble, run, dance, and basically run wild for an hour and a half. 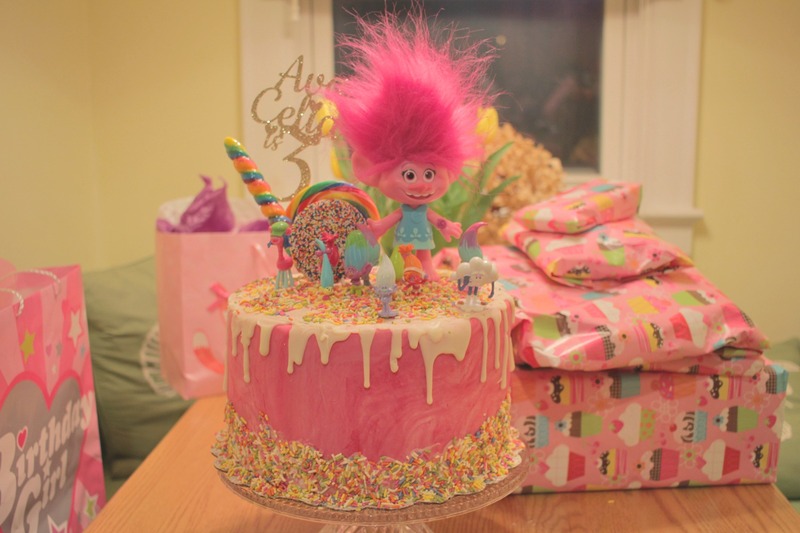 To add a troll flair, I decided to make a troll cake; a cake decorated like the rainbow, with a medley of bright jimmies (got to have sprinkles of course!!! ), rainbow colored lollipops, and of course, the entire cast of the Trolls movie on top. I just love the drip cakes that have been all the rage lately, but I also wanted to add sprinkles to the bottom and different colors on the sides. So I decided to do a test cake and figure out how to drip white chocolate AND add jimmies to the bottom. 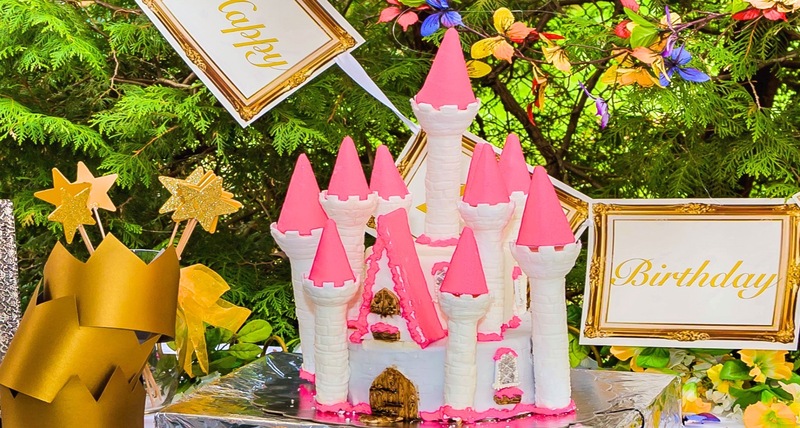 I recommend watching a tutorial on how to make fondant cakes first. Wilton has some terrific tutorials on Utube, I definitely suggest watching for the novices like me! For my test cake, I basically heated up candy melts with a little bit of milk and butter and applied them to the bottom half of the cake. I made sure my cake was on a stable surface (on a cookie sheet), and as I applied the candy melt to sections of the bottom, I immediately took a handful of jimmies and “glued” them to the candy melt. If the candy melt dries too fast, just take a hairdryer (or a click and flame lighter) to remelt the candy. 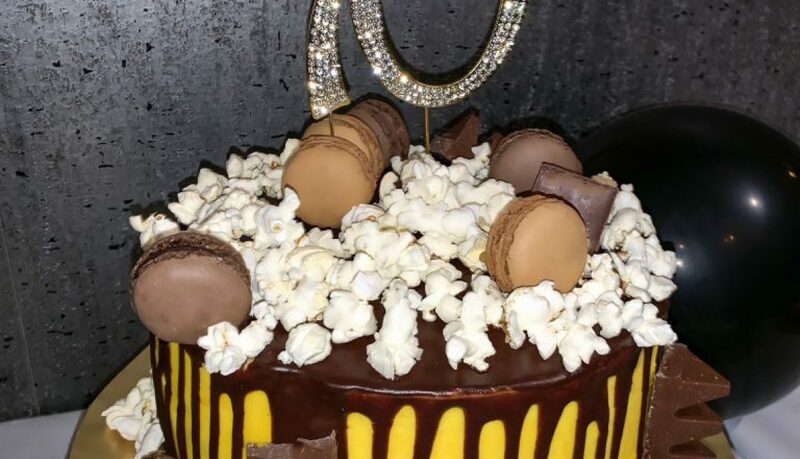 Once I felt I had the drip part down, I decided to take the cake to another level, and add more colors. I decided to try my hand at airbrushing, and create three color stripes, Yellow and Pink, with the final stripe being the rainbow sprinkles. 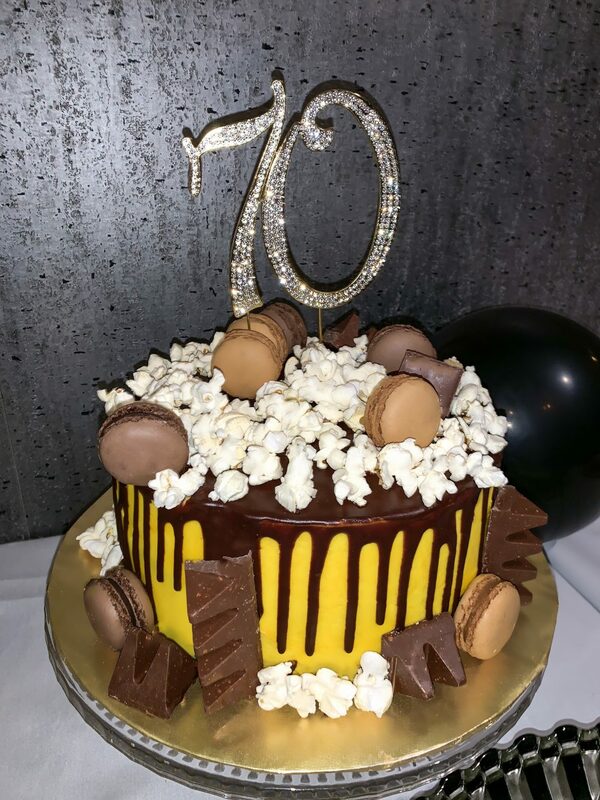 I achieved this with the use of a cake airbrush , I personally love the one I found on Amazon. It was extremely easy to use, I just added the food coloring and as much water as needed to achieve a bright pink and yellow. If you don’t know me, you wouldn’t know that I’m a stickler for using organic foods without the use of artificial flavors and dyes. I was able to use all my natural food dyes easily with this airbrush! I love Color Garden Pure and Natural Food Colors, and the Sprinkles are India Tree, carnival colors. 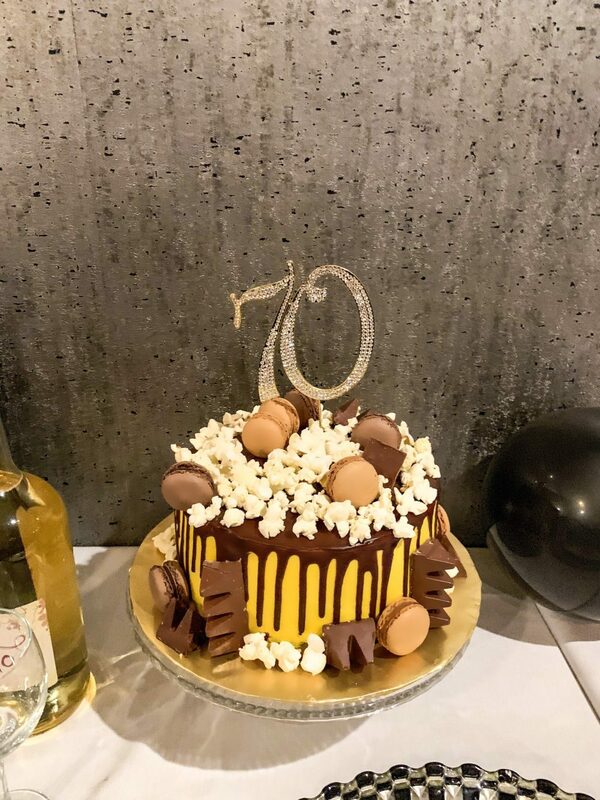 So here is how the cake turned out! It really was a troll-tastic hit! 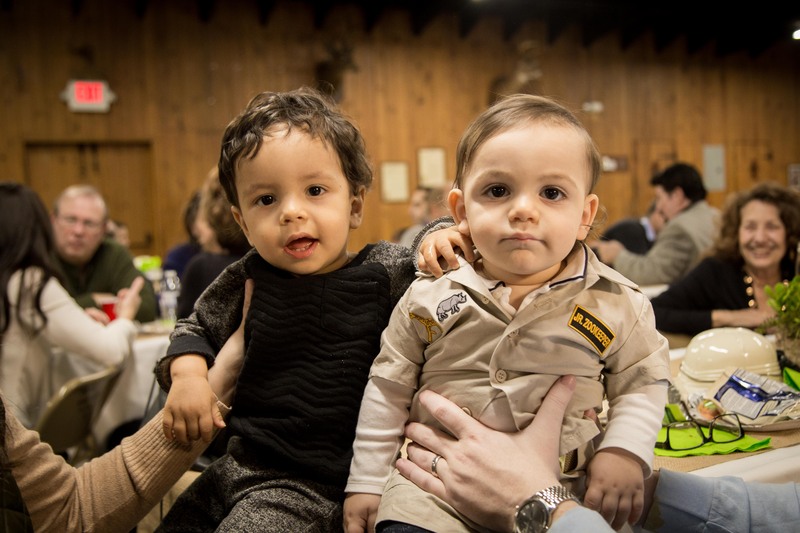 SO my son is now 15 months, goodness how time flies! 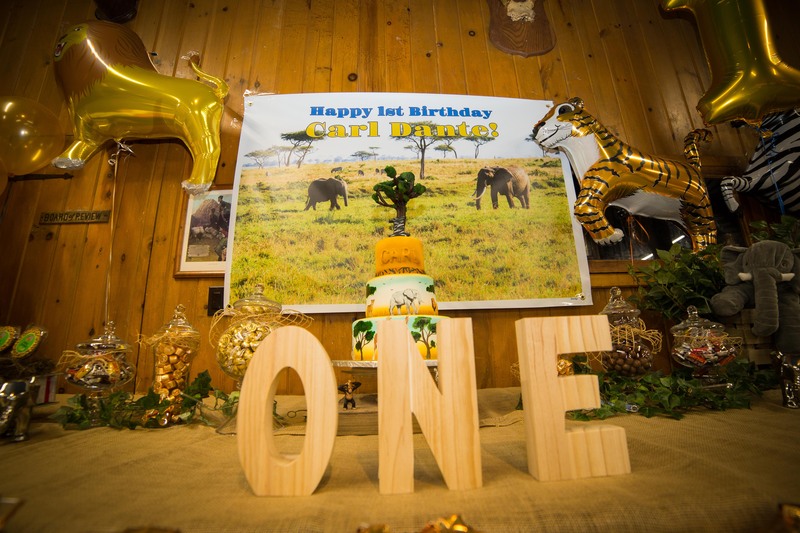 I say that as I am finally getting to posting his First Birthday party that was in December (might I add a Safari party in the height of a snow storm!). My husband and I are somewhat obsessed with Africa safari animals, as we went to Kenya and Tanzania for a safari on our honeymoon, and our son’s bedroom could be an ad from the”And Beyond” Safari tour company. 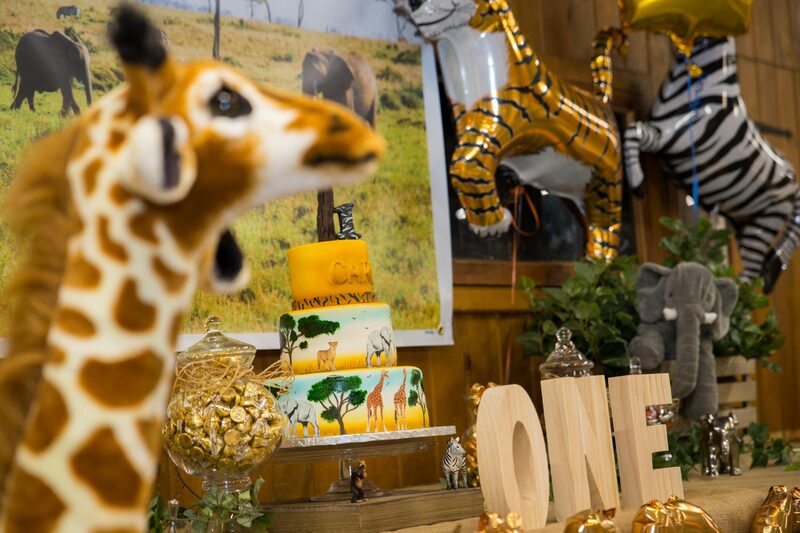 Seriously, how sweet is this theme though for a boy’s first birthday party! 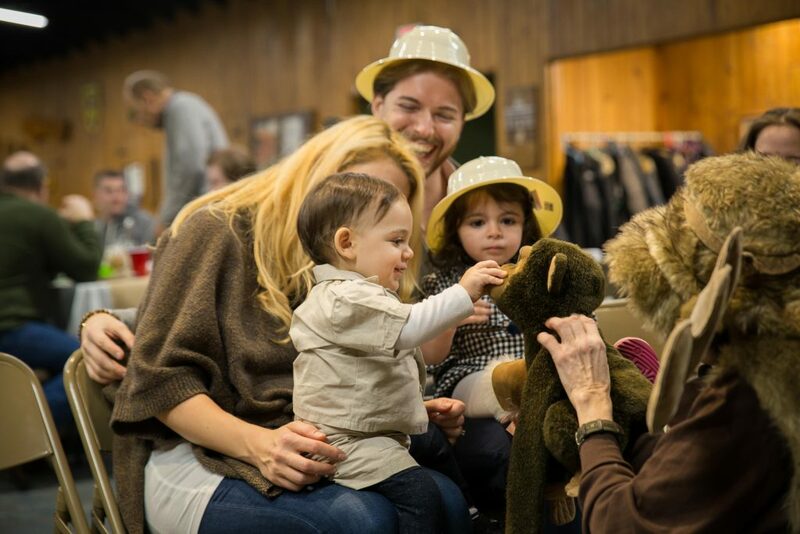 To be fair, we decided to try and do the same entertainment for Carl that we did for my daughter, so we had a zoo themed puppet show with “Maggie the Moose.” Maggie brought out safari animal puppets, Carl loved the songs and tried to kiss the tigers and bears. 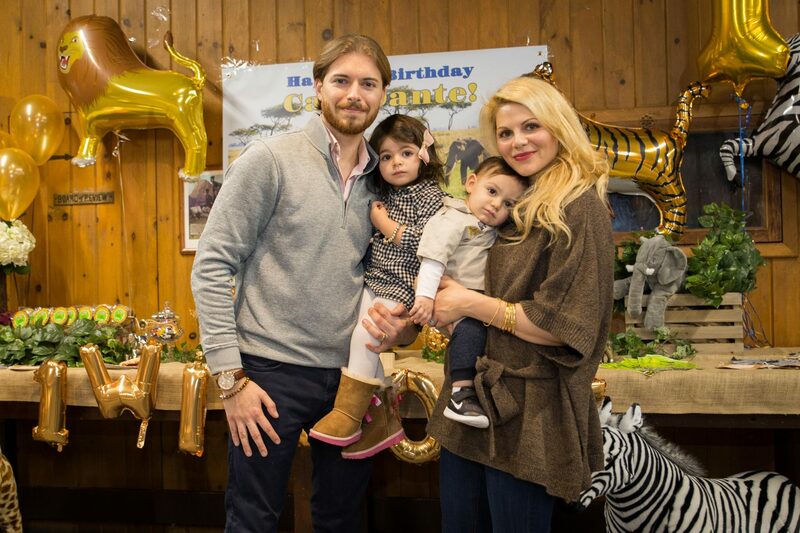 It really was a hit!such as lions, giraffes, zebras and even forest animals. 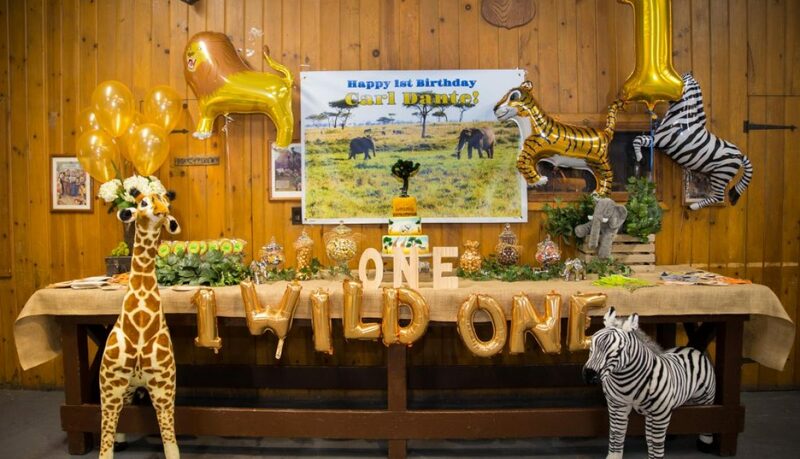 Carl loved the songs and tried to kiss the tigers and bears. It really was a hit! For the tables, I picked up burlap cloth from the fabric store and cut them into runners. I almost do this for every party, and its a real money saver! I ended up spending less than $40 (with a coupon) for the runners, and used cactus plants and the binocular party favors for centerpieces. 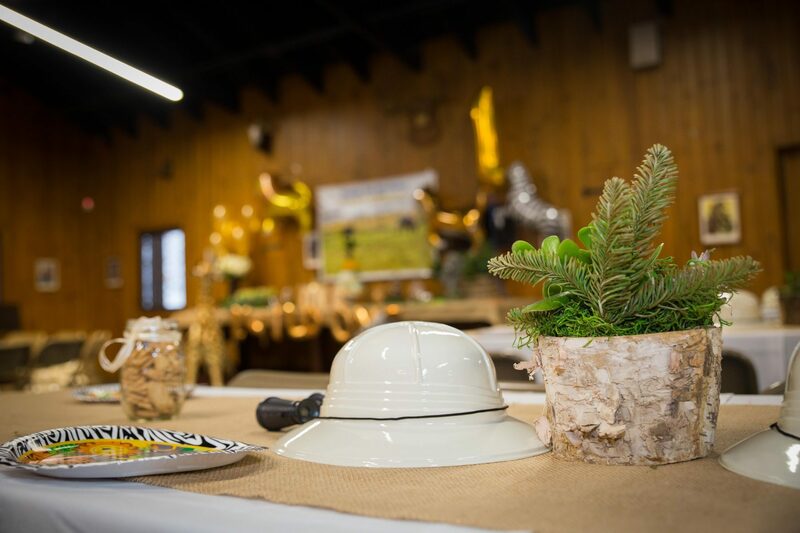 I tried to keep to the safari party, or zoo party theme throughout the room. 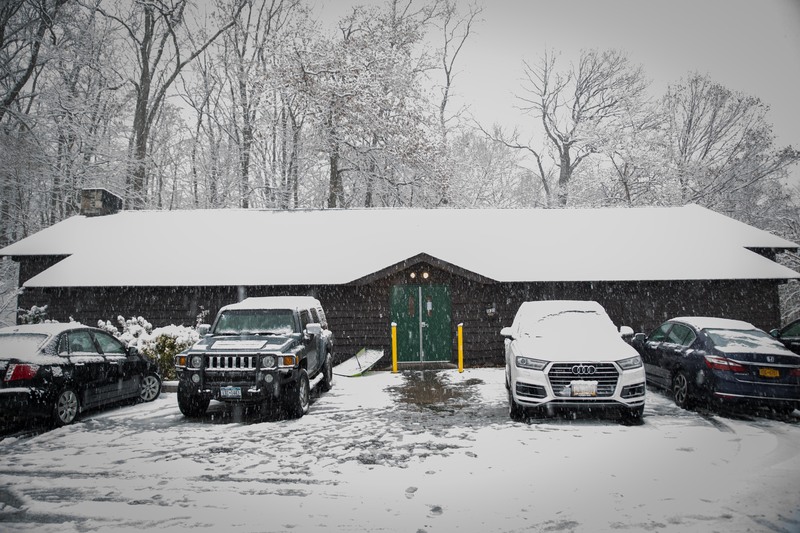 Surprisingly, friends and family did show up even though we got almost 4 inches that Saturday! I didn’t know they got snow in Africa…but it seems the lions, zebras, elephants, and monkeys all kept warm! 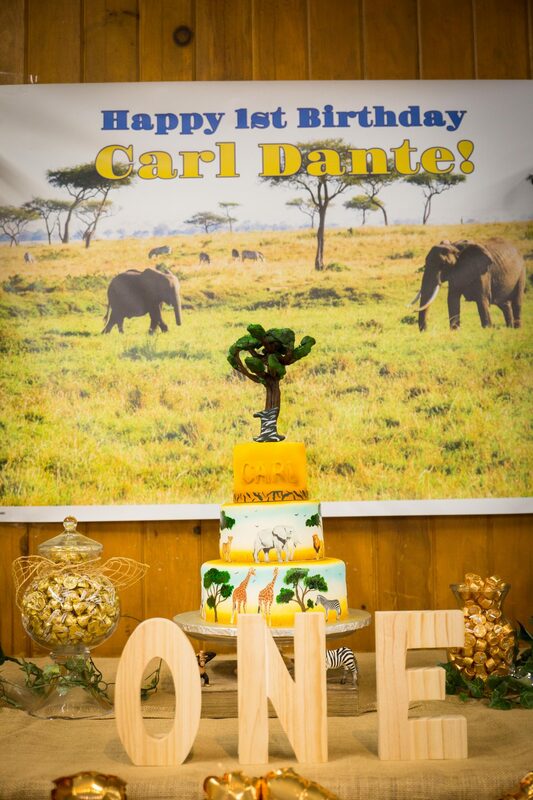 We tried to have it nice and toasty inside the cabin, picking binoculars and safari hats for favors, and a tiered cake full of lions, zebras, elephants and monkeys’ silhouettes and an African Acacia tree at the top! Overall, I would say a definite success. 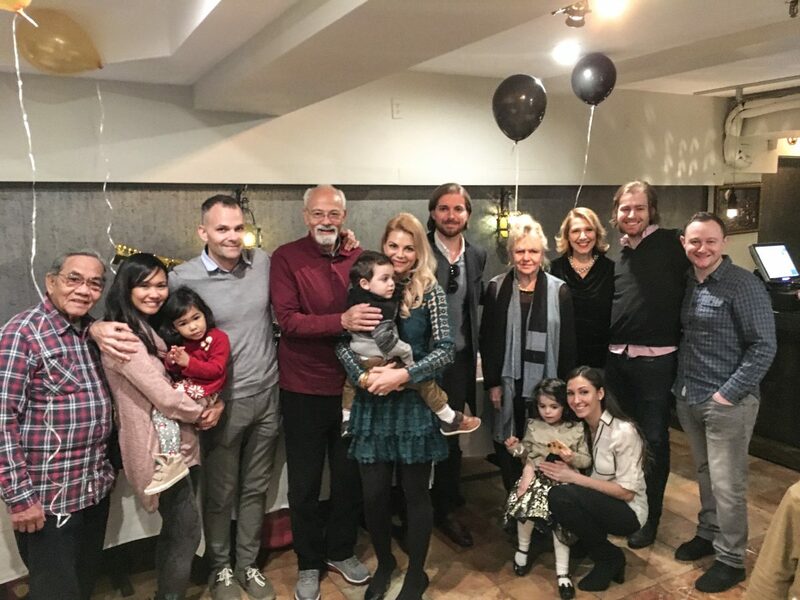 Here are some more pictures of the decor and our friends and family that made it out–hope they felt like they were on a trip to Africa for a couple hours! Any excuse to escape NY in the winter is a good escape! Oso Bucco topped with roasted veggetables served over marscapone polenta. I Made the chocolate cake base first, adding wet ingredients to dry slowly in my kitchen-aid mixer. Then I poured the creamcheese mix over the cake batter. While the cakes were resting, I made the most fluffy chocolate muse frosting ever! After whipping it up it seemed very thin. 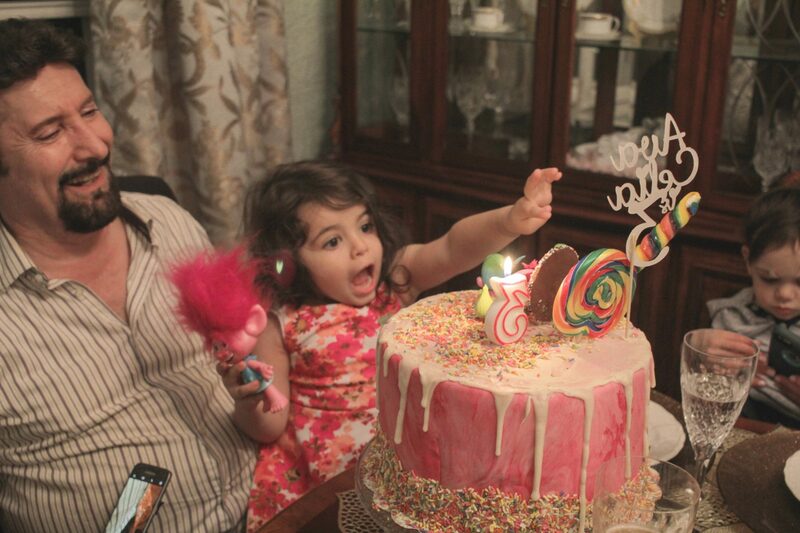 At first I got kind of worried that it would run right off the cake! I left it alone for about 10 minutes and it thickened right up! Next I layed parchment paper on my cake stand. This helps keeps the glass clean–I remove the parchment after frosting my cakes. Makes a much cleaner presentation! 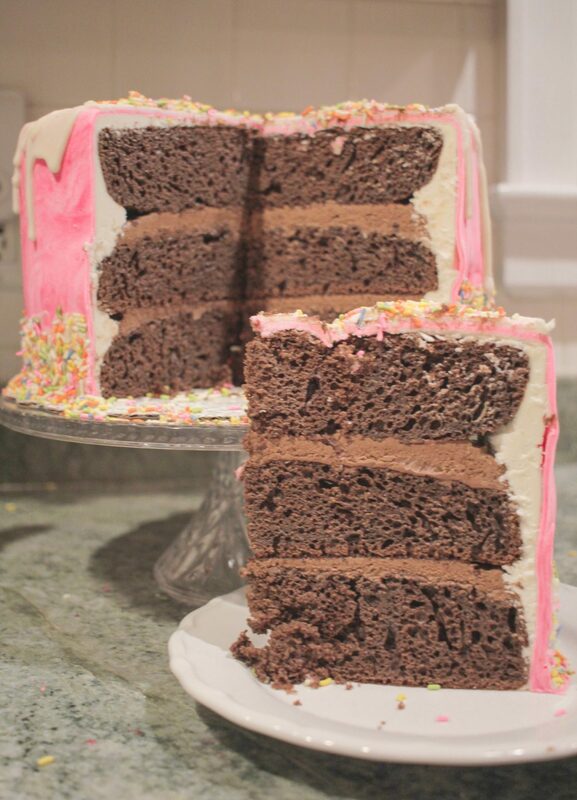 Place the bottom layer on the cake stand and give a generous layer of frosting…. Put the last cake layer over the bottom and frosted the whole cake. While I did this I cut up and toasted walnuts. The recipe called for peacans, but I had walnuts on hand so used these. Here is the end result! Ahhhh sooo lovely! So I hid this in my cubbord (if you can help it, don’t put in the fridge. It will be more moist, smooth and shiny at room temp) and worked on the dinner! Last slice after the dinner…. A little about this dish. On our honeymoon in Africa last year, Carl and I had a dish that was so delicious, Carl and I had to find out what it was. The meat was so tender, falling off the bone at the slight touch of our forks. 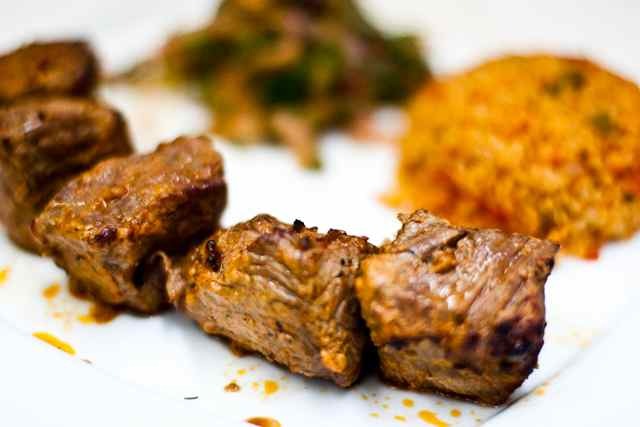 Surrounded by this louscious meat was a thick flavorful sauce with bits of carrots and celery, all over a whipped mash potato. The garnish was parsley and lemon zest, a combination that added a fresh element to this already perfect meal. This was Osso Buco. I swore I would try to recreate this masterpiece! This dinner seemed to be an occasion fitting for this dish, however I was worried preparing something seemingly so complicated, especially for my husband’s family! I did a little research, spoke with one of my doctor’s offices (I call on doctors for my day job…I’m a pharmaceutical rep). I happened to be in a doctors office chatting with an older Italian receptionist. She is a true food lover, and makes Oso Bucco at least six times a year. She pretty much recited the ingredients and directions off the top of her head. She inspired me to attempt this amazing dish, and helped calm some of my hesitations. My sister in law is engaged and her shower is in exactly one month. My mother has been planning every day trying to get everything ready and perfect. She was thinking Nicole would love a Barbie Bridal cake, which of course I agreed would be perfect! What girl wouldn’t? When she told me how much the bakery wanted to charge her I said no way! Send me a picture and maybe I could do a run-though this weekend and try to duplicate it…? I did some research and I thought I could try my hand at a barbie cake. How hard could it be? I decided for my first trial, I would use a real Barbie. Luckily, my mom just sent me an old Barbie of mine in the mail as part of my birthday gift last week! Talk about timing! 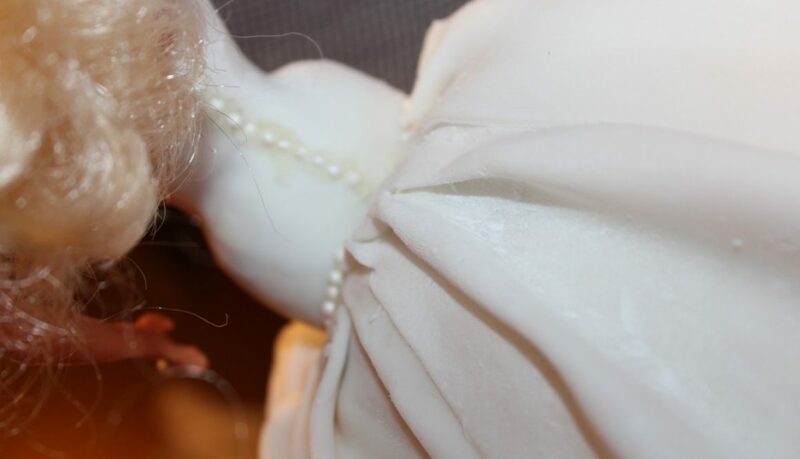 Since Barbie is bigger than the wonder mold, I baked two other 9″ rounds for the bottom of her dress. Nicole the Bride-to-be loves Mermaid dresses, so I would try to do more of a mermaid flare for her. ~~Bake your cake (I used red velvet) in the mold. I just used a cake box, but instead of water used Buttermilk. Allow to cool–I cooled mine in the fridge overnight. ~~I whipped up the cake mix (I substitued applesauce instead of oil, makes for a very moist cake!). I divided the batter in half, using purple food coloring. ~~ Next I divided the cake batter in the cake mold to create checkered slices! ~~After all the cakes were cooled, I used a Spray and Seal Crum Seal on the cakes. This prevents the cake from crumbling on you when you coat with buttercream. Back in the fridge. 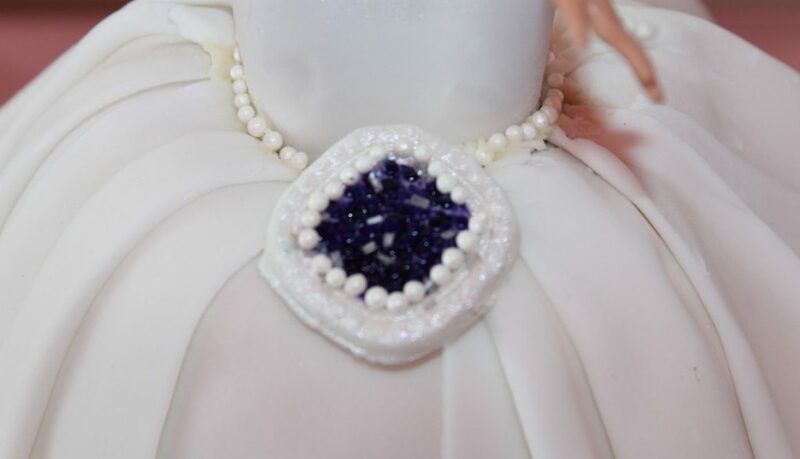 ~~Here I I divided the dress cake in three even levels using a cake leveler. You can use a knife. 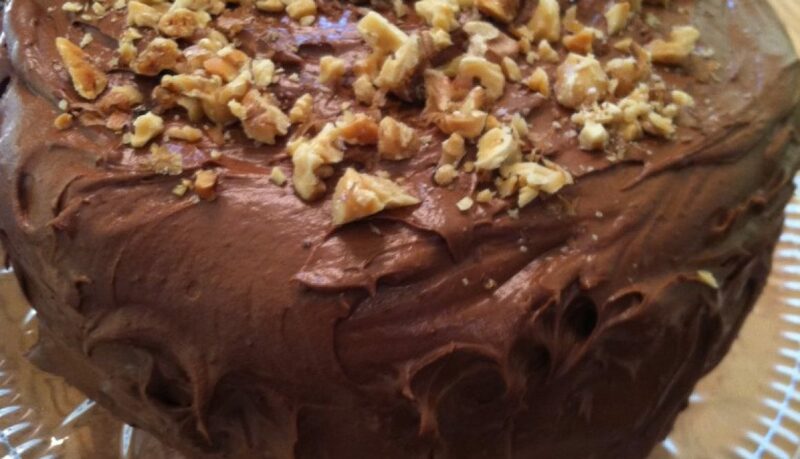 ~~Now the fun part–Frosting each layer and aseembling the cake! I staked the Red Velvet on top of the two bottom cakes.